Xfce, LXDE, and other desktop environments are often referenced as being lighter-eight Linux desktop environments than KDE and GNOME, but what are the measurable performance differences between them? Curious how much of a quantitative impact the GNOME, KDE, Xfce, and LXDE desktops have on netbook systems, we carried out a small set of tests to look at the differences in memory usage, battery power consumption, and thermal performance. While the Phoronix Test Suite is most often used by us and others to carry out direct performance benchmarks or other tests using the different test suites and profiles, the open-source testing platform of ours also has an advanced sensor monitoring framework with logging capabilities. The Phoronix Test Suite through the underlying Phodevi (Phoronix Device Interface) library is able to monitor various system vitals ranging from hardware sensors like the CPU temperature, system temperature, and battery power consumption to software values like the CPU and GPU utilization, IOwait, disk read/write speeds, and memory usage. In fact, all of these metrics can be monitored while the Phoronix Test Suite is running any of the standard tests/suites. To monitor all of the hardware and software sensors while running say the Nexuiz game benchmark, simply run MONITOR=all phoronix-test-suite benchmark nexuiz and the system_monitor module that provides this functionality will be initialized through the MONITOR environmental variable. You can also get creative and use MONITOR=all phoronix-test-suite run idle or MONITOR=all phoronix-test-suite run battery-power-usage, as we did for the test results in this article. The system we collected monitored these system vitals on while testing the GNOME, KDE Software Compilation, Xfce, and LXDE desktop environments was a Samsung NC10 netbook. The customized NC10 netbook was loaded with an Intel Atom N270 processor, Intel 945 graphics, 1024 x 600 LVDS panel, 2GB of system memory, and a 32GB OCZ Core Series SSD. On the software side was an Ubuntu 10.04 development snapshot from 2010-03-07 with the Linux 2.6.32 kernel, X.Org Server 1.7.5, xf86-video-intel 2.9.1, and an EXT4 file-system. We installed each of the tested desktop environments through the Ubuntu Lucid repository and they included GNOME 2.29.91, KDE SC 4.4.1, LXDE 0.5, and Xfce 4.6.1. Between testing each of the different desktops we rebooted the system and ensured each desktop was left in a clean state as well as maintaining other variables to ensure as accurate testing as possible, but and while they are not 100% accurate due to different Ubuntu-packaged defaults for the different desktops, this should still provide a accurate look at the different areas. The first set of metrics come from monitoring the system information while running the battery-power-usage that causes the system while running on its battery to idle for 60 seconds, idle for another 60 seconds but with the LVDS panel off via DPMS, and then to playback one of the sample video files when the LVDS panel has been restored. The delta between the LVDS panel being on and off should not change with the different desktop environments, but we used this test as it is part of our de facto netbook testing suite and to see if any of the desktops do react differently when the power management state has changed. 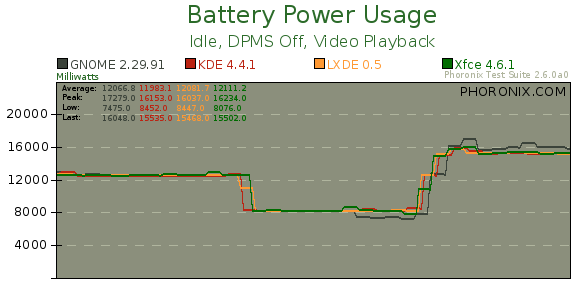 We began by looking at the battery power consumption with this test under GNOME, KDE, LXDE, and Xfce. With this test, there were not any significant power consumption differences when choosing one desktop environment over another. All four of these popular desktop environments had consumed on average within 0.2 Watts of each other. What is more interesting than the indifferent power consumption is the memory usage. Here we are effectively looking at the system memory usage right after the desktop was started and the only application that we manually started was the desktop's respective terminal. These results are very clear showing the Ubuntu 10.04 system with LXDE consuming the least amount of RAM with it being about 30MB lighter than loading the Xfce 4.6 desktop. Eating much more memory than the lightweight Xfce/LXDE desktops was KDE 4.4.1 that ended up leading to 67% greater memory consumption than LXDE. GNOME 2.29.1 had a 24% smaller memory footprint than KDE 4.4.1. Of course, with using the Ubuntu packages, the upstream KDE Software Compilation packages may vary a bit from these numbers. 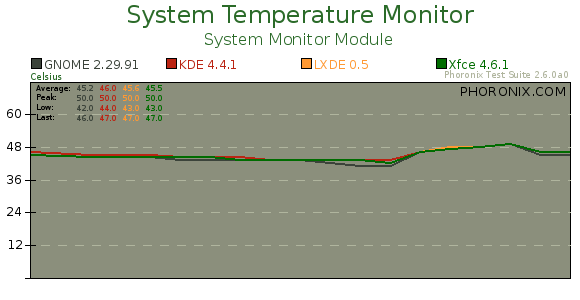 There were no measurable differences in the system temperature when running the different desktop environments with this first test. Message From Actualtests: If planning to pass the HP0-J33 exam to complete your CISM certification then try out our up to date braindump prepared by certified experts to provide you guaranteed success in exam.